Yes, this recipe was another inspired find via Pinterest. When will the intervention be scheduled? No, really, I’m not that bad. Honestly there’s a lot of junk swimming around the site now that it has become so overwhelmingly popular. That means that I get extra excited when I manage to come across an idea that makes a lightbulb burst into brilliance over my head like I’m a food blogger cartoon. 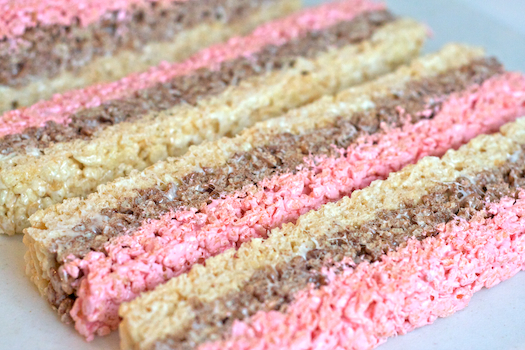 It takes a lot to get me gushing and exclaiming these days and the things that do usually involve zombies, Kate Middleton, or Jensen Ackles so these pretty Neapolitan Rice Krispie Treats via The Partiologist are definitely in good company. My method for crafting these addictive layered squares is slightly different from the original post. I couldn’t find strawberry flavored marshmallows so I opted for strawberry fluff instead. I also used a 9 by 13 pan as the base for the squares and made 3 entire batches of treats. All of that sticky marshmallow stirring practically gave me carpal tunnel. Ouch! 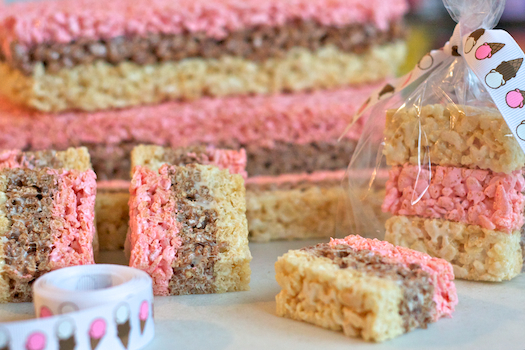 Each batch of cereal was then very firmly pressed into place in the pan, and chilled for a time in the refrigerator in between making the vanilla, chocolate, and strawberry layers. The most entertaining part of this task was when I flipped the entire pan over onto a cutting board to begin slicing the treats into servings. That brick of sugary sweetness looked the the perfect building block for a fairy princess castle. If only we could craft our homes out of Neapolitan-striped bricks. How cool would that be?! Anyway, I thought that all of this stirring and pressing and marshmallow scraping deserved a slightly cuter presentation than the usual ho-hum tupperware container. So I found some seriously adorable (and matching) ice-cream cone ribbon on Etsy and bagged the treats in little towers before I sent them off to CK’s office. Even though this is a time-consuming activity I would make them again in a heartbeat. The chocolate-vanilla-strawberry combo is to die for and I think I’ve developed a little obsession with strawberry fluff. Yet another pink food to add to my ever growing arsenal! For the Strawberry Layer (Note: I followed the recipe for Fluff based treats for this layer. It is slightly different from the other two layers). Begin by lining a metal square edged 9” by 13” pan with aluminum foil. Instruction are available here. Use a pan that has high sides. Casserole dishes with rounded edges will not be able to hold all of the treat layers. Generously spray your prepared pan with cooking spray. For the Vanilla Layer melt the butter in a large pot over medium-low heat. Add the marshmallows and stir continuously until they have melted completely. Quickly stir in the rice cereal until it is completely coated. Pour the mixture into your prepared pan. Spray a rubber spatula with cooking spray and then firmly press the marshmallow covered cereal into the pan. Place the pan in the refrigerator. Wash out your cooking pot and proceed to the Chocolate Layer. For the Chocolate Layer melt the butter in a large pot over medium-low heat. Add the marshmallows and stir continuously until they have melted completely. Quickly stir in the Cocoa Krispie cereal until it is completely coated. Pour the mixture on top of the vanilla layer in your prepared pan. Spray a rubber spatula with cooking spray and then firmly press the marshmallow covered cereal into the pan. Place the pan in the refrigerator. Wash out your cooking pot and proceed to the Strawberry Layer. For the Strawberry Layer melt the butter in a large pot over medium-low heat. Add the strawberry fluff and stir continuously until it has melted completely. Quickly stir in the rice cereal until it is completely coated. Pour the mixture on top of the chocolate layer in your prepared pan. Spray a rubber spatula with cooking spray and then firmly press the marshmallow covered cereal into the pan. Place the pan in the refrigerator. When the treats have cooled completely, remove them from the pan. Place them on a cutting board. Discard the aluminum foil and cut the large rectangle into slices. Then cut each large slice into smaller squares. Enjoy! 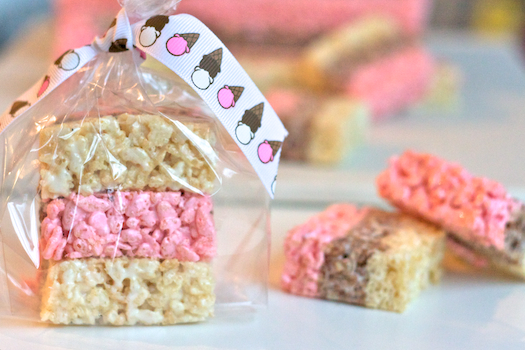 I have been craving rice krispie treats and these are adorable so I think they must be made! Thanks for such a fun looking post! We’ll have to chat. I haven’t actually made any design changes. I wonder if something has broken for a specific browser? Hmm…. we’ll get to the bottom of it. This is a great idea for a baby shower brunch I’m giving soon. Where do you buy the strawberry fluff? I’ve never seen this before! A link to purchase the fluff is actually in the text of the post. I bought mine on Amazon but you can also buy it directly from the manufacturer’s page as well. Just Pinned these… love them! I am so going to make these! Gorgeous!!! And I am sure…very tasty too. Thank you so much Joan! I had the same reaction when I first saw these on the blog I linked to in the post. The colors were just so pretty and I instantly wanted to make a batch myself. I hope you get a chance to make some soon. Where do you find strawberry fluff? I also think you can get it at some grocery stores and Targets but I would call first before you end up on a long strawberry scavenger hunt. Now this recipe excites me a lot! I’m gonna have to make it this coming weekend for sure. How bout making the vanilla layer with peanut butter? Or, with the three layers dip one side of the square in chocolate? mmm…. Graduation party coming up for my daughter, brains working overtime! Thanks for the idea! Just joined pinterest and this was my first pin. Love it! Love the idea 🙂 and special thanks to Miss Lisa @ Snappy Gourmet for pinning it for me to find! Just found your site through this recipe’s photo on Pintrest (and then laughed at how you got the idea from there, too). This caught my eye right away. Love the concept! I couldn’t find strawberry fluff, marshmallows, or extract anywhere, so I just made the strawberry layer with the same marshmallow/butter combo as the other two layers. I then stirred in strawberry gelatin powder before adding the cereal. It worked great and got rave reviews! A full batch probably needs 3/4 or 1 small packet of gelatin. Thank you for sharing this great tip for another option re: making the strawberry layer happen! I know finding that crazy fluff/marshmallow combo isn’t always an easy task. I bet you could stir in strawberry syrup (the kind by Hershey to make strawberry milk) into the marshmellow if you can find strawberry fluff or marshmellows..
Follow-up- i used a 1/4 cup of the hershey’s strawberry syrup and it worked out great! These were the hit of the party! These sound amazing!! Thank you so much for sharing 🙂 Can’t wait to try them out! I actually found Strawberry Rice Krispies at the Fresh and Easy grocery store. I know they’re in the Los Angeles area, but not sure about other places. I made these for a bbq yesterday and they were a hit. I also just divided the recipe in thirds, so that the entire three layers made one batch. That seemed like the perfect amount. (2 cups marshmallows, 2 2/3 cups of each cereal…) Also added a generous splash of vanilla extract to the “vanilla” layer, to give it a little more flavor against the chocolate and strawberry. I just made these for my daughter’s class tomorrow – it’s her birthday. I used the strawberry marshmallows but everything else was the same. They taste like a regular rice krispie treat. I can’t taste the strawberry or chocolate layers. Any ideas other than more artificial flavors to make those two layers stand out more? 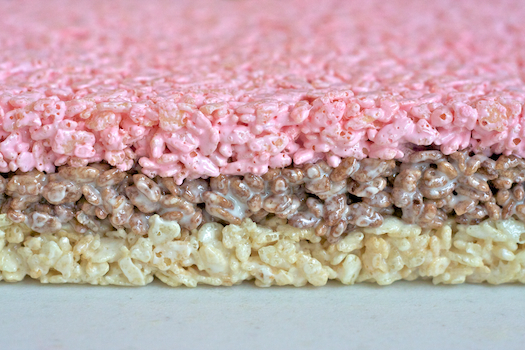 I used cocoa in the rice krispies, and Nestle Strawberry drink mix in the mashmellow.. The flavors was just like eating a Neapolitan ice cream bar. I tried your recipe…with a few changes. 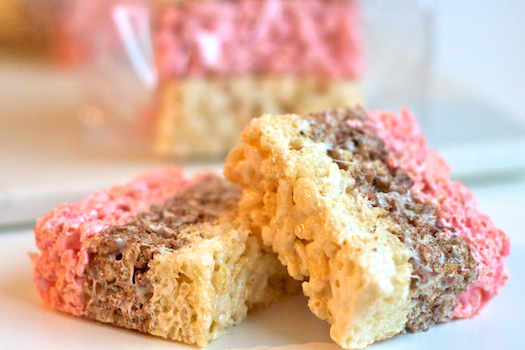 First I took one recipe for Rice Krispies treats and divided it into 3rds. I couldn’t get strawberry fluff or mash mellows…so…..I used 1 and 1/2 Tablespoon of Nestle Strawberry drink mix , add to the marshmellows while they melted.. and did your cocoa for the chocolate as you did….why buy more than you need… They were AWSOME….Thank you. That’s a fantastic substitution idea Patsy! Thank you so much for sharing it. I know finding strawberry marshmallows or fluff is not an easy thing to do, but Nestle Quick is definitely much easier to procure. I used strawberry jam and mixed in with marshmallows worked great! I just lucked out and found a mix of strawberry & vanilla marshmallows at my store. About to make ours now. Found you via pinterest. Thanks! 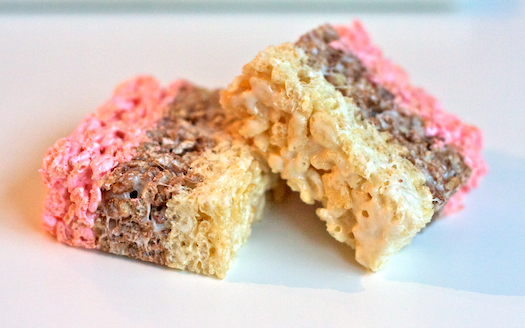 43 Variation of the Rice Krispies Treat | …………..365 Days of Eating in…………..